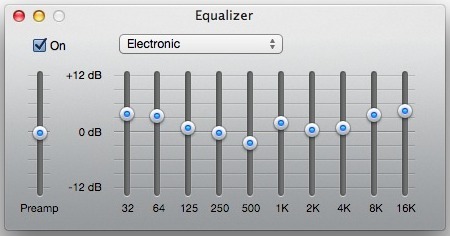 Unless an entire music library consists of only a single genre of music, it’s fairly rare to have find one equalizer setting for your iTunes collection to rule every single song or album. Sure there are some pretty good general settings, and the preset options are great too, but for the best experience with diverse playlists and music collections, consider setting individual equalizer settings for specific albums, artists, genres, or even songs on a per-song basis. This will work the same in Mac OS X and Windows, and though it’s certainly not applicable to everyone, be aware that if you set up a universal audio equalizer for all system audio in OS X using something like AU Lab you may run into EQ exaggeration that you wouldn’t otherwise encounter. You can repeat this process for as many individual songs, albums, artists, or even genres, and there’s no limit to how many different EQ’s you want to set, it’s just a matter of configuring it yourself. 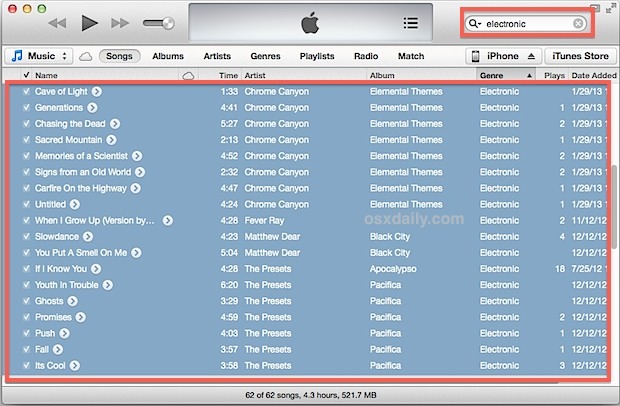 For adjusting large groups of songs together, specifically genres, it’s best to use the search feature as outlined below. To adjust equalizers for large groups of songs or genres, we’ll use the search function to narrow down a genre type and then apply the setting to everything. Be sure to toggle the setting to bring normal search functionality back to iTunes results if you’re running 11.0 or later. 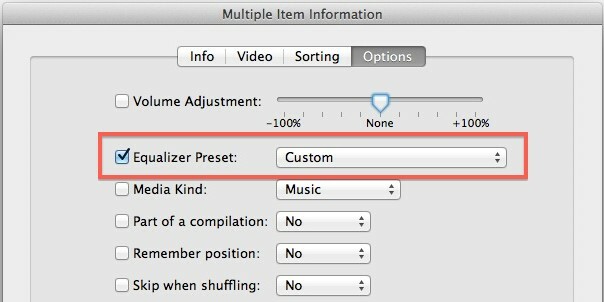 Remember this setting will only apply to items that were selected and edited together, and any new songs or albums imported into iTunes will have to be set individually or else they won’t contain the same equalizer configuration. 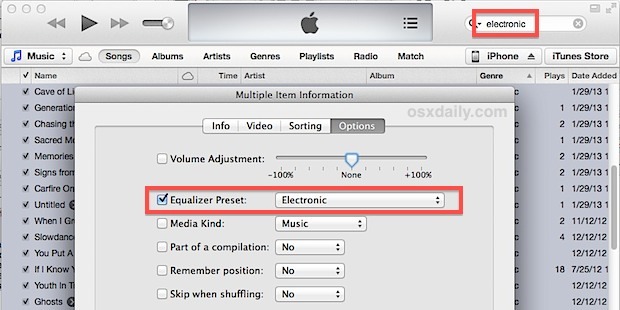 If you’re changing these settings because you want to improve your music listening experience, consider also making three simple adjustments to your iTunes settings to accompany tge custom equalizer settings, they will automatically balance song volume, cross-fade songs, and make music sound better on less-than-optimal speakers. Are the equalizer presets set for each song stored in the cloud with iTunes Match, so they work also when music is played on my iPhone? 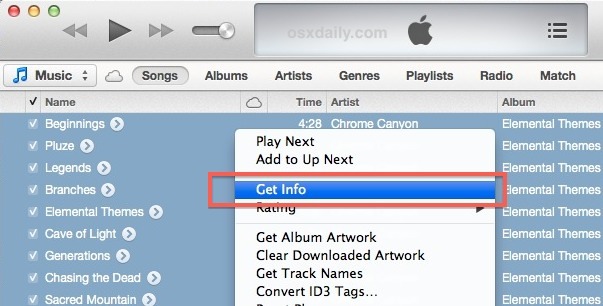 A little tip: With XiphQT (http://xiph.org/quicktime/) you can listen to and export Xiph.org formats (e.g. : Ogg, Theora, Vorbis, Speex, …) with QT-based apps.